Pune, 16 August, 2017: India’s 4G experience is all set to get more exciting with the launch of ELITE 4G from the house of Swipe. 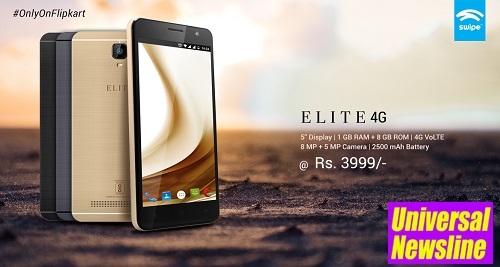 The new launch in Swipe’s celebrated ELITE series promises to offer an unmatched 4G experience to the aspiring Indian youth. The value for money device is expected to cater to the need of the hour by offering cutting edge technology at an astounding price of Rs. 3,999/- for 1 GB RAM.